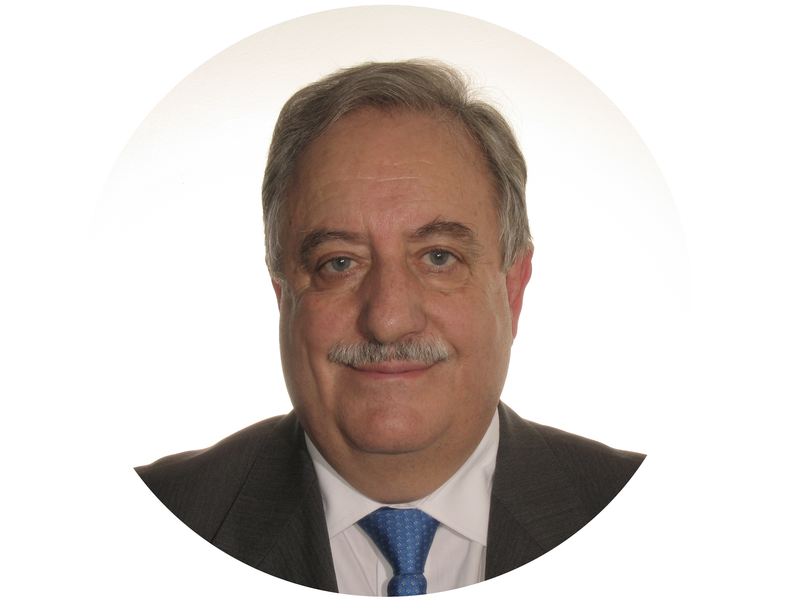 In his 30+ year career, Juan Ignacio Burgaleta has seen the evolution of CSP from concept to reality and led landmark projects such as Gemasolar (Tower, 20 MWe with 15 hours of thermal storage). Today he will tell us why thermal energy storage is essential to optimizing dispatchability and operations of CSP plants. C.M. What are the benefits of adding thermal energy storage to a CSP plant? The greatest benefit is that it enhances dispatchability. Let’s say that we are producing at full capacity and the grid operator tells me that he needs our CSP plant to dispatch 50% less energy, we can match that requirement within 15 minutes. And the primary energy is not lost, it’s stored as heat in our molten salt tanks so we can produce electricity later on. So, if the operator asks me to ramp up production again, I can go back to 100% in 15 minutes. That would be impossible without thermal energy storage. I can also provide the grid operator with accurate production forecasts, I can tell the grid operator how much electricity I’ll pump into the grid in the next 24 hours with 95% certainty. If the hot molten salt tank is at, say, 30 % or so, this goes up to 99% for a 4-5hour production forecast. This is great news for grid operators because it makes the grid a lot easier to manage, particularly if you have a lot of wind and PV, whose production spikes and drops in response to atmospheric conditions. Since CSP can ramp-up and scale back rapidly, it can help accommodate the electricity produced by variable renewables. 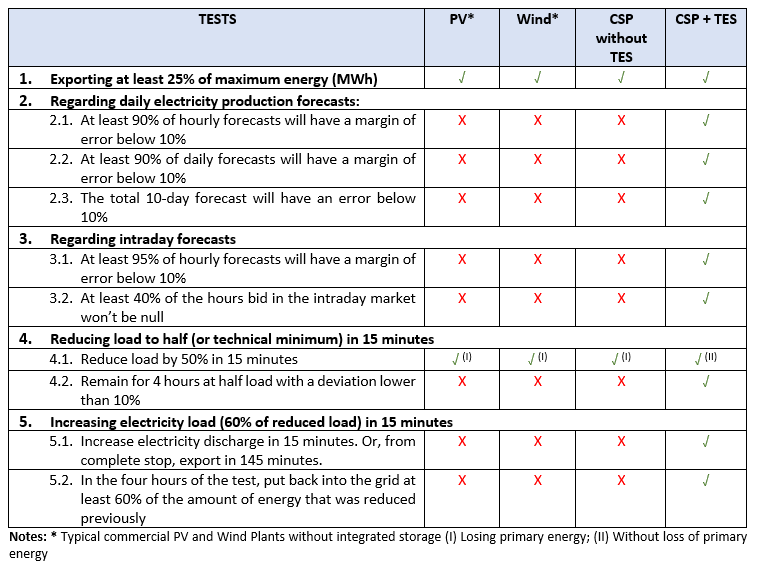 In Spain, where there is a significant share of variable renewables, the grid operator (REE) favors renewable energy plants that can prove they are dispatchable by passing certain tests (See Table 1). CSP with TES passes these tests with flying colors. C.M. Sounds impressive but as the saying goes, there is no such a thing as a free lunch. What is the price for these added benefits? Thermal storage means that you need to build a larger solar field but overall efficiency gains outweigh the increased capital expenditure. In my experience, a CSP plant with an 8-hour thermal storage system (TES) requires 60% more investment in the solar field than a CSP plant without TES. But then, production also increases by about 68% thanks to the TES, so there are net gains. On top of increased dispatchability and increased production, thermal storage brings many more benefits. A CSP plant with TES the turbine runs at nominal capacity for most of the time, minimizing stopping and starting, which optimizes performance and keeps maintenance costs down. The combined result of all these benefits is that CSP with TES has a lower cost per MWh than CSP without thermal storage, provided that the size of the storage tank has been optimized. C.M. 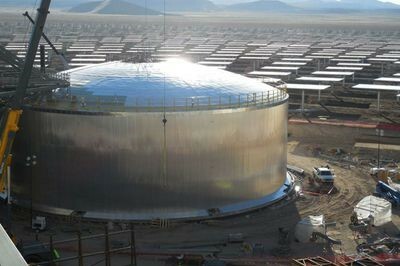 What are some of the greatest misconceptions about CSP with thermal storage? There are so many. I have met engineers who don’t seem to think that CSP with TES can produce at night. Of course it can! The thermal storage system is there to store heat during the day and then dispatch it when required, even if it’s at midnight. Another common misconception is that molten salt tanks leak much heat. In fact, losses are very small. If you didn’t inject any more energy into the tank, it would lose about 1 Cº per day. C.M. Many thanks for sharing with us today, anything else you would like to share? Thank you. I would like to make clear that CSP with TES is a proven technology with a commercial track-record so it is a secure and reliable option that can be deployed right now.